I've become obsessed, read: obsessed, with patterned booties. Floral, jacquard, paisley, just give me them all! Slowly but surely, these styles have been infiltrating the fashion scene and I love how different they are from your typical black ankle boot. You can pair them with anything-- more solids, more patterns, and other fun colours. This year I have been so drawn to dark, moody florals, and it's taking everything in me right now not to purchase the Eagle Frosted Heels (#3), or the Dune Oxford Florals (#5)! I mean pink floral booties, people!! If only the Holidays weren't so soon... 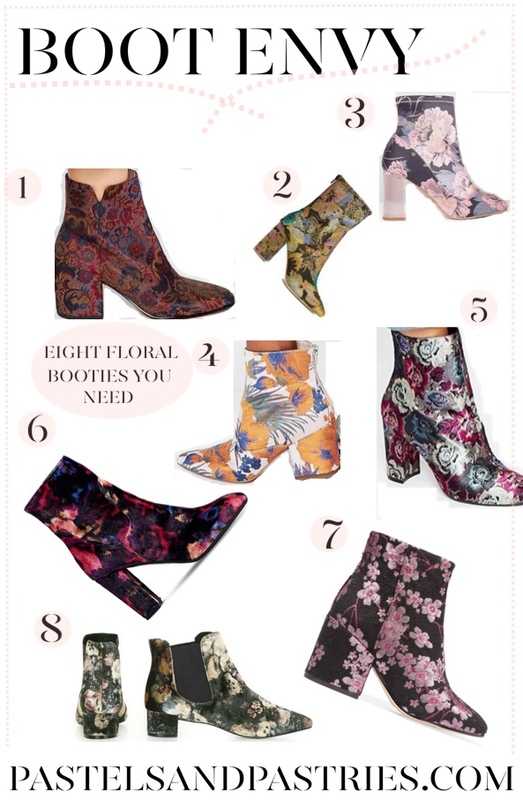 I've rounded up a serious selection of floral ankle boots you need to add to your closet right now, and I'm dying to know which are your faves? Would you go for it, or will you be sticking to the more neutral colours until spring? LOVE! I have been wanting a fun pair like this. These are wild! I don't think I could pull these off, but I'm into them. Love style #7! Love the first pair! A little subdued compared to the others but so fun! These are so cool! I love statement booties so much, probably the only chance I have of ever wearing colour lol!